Miranda Lambert is the newest personality to join the "Got Milk?" campaign. 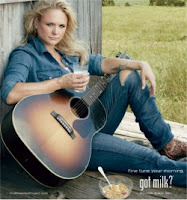 The singer revealed the ad campaign's photo of her sitting on a porch wearing a denim shirt and jeans while holding a guitar and holding a glass of milk. The photo also shows her sporting the iconic "milk mustache" that is featured in all of the ads in the campaign. The campaign's slogan is posted in the right hand corner of the photo and it reads, "Fine tune your morning. Got milk? Nourish every day." Miranda says of her involvement in the campaign, "It's such a good fit. I'm a girl from Texas. I grew up having big breakfasts with my family, and milk was always on the table. My mom was always up with us before school and made sure we had protein, which included cereal with milk or a pop tart as we headed out the door with a glass of milk to go." Of course, we'd love to get her here to Wisconsin more often so she can enjoy the best milk in the nation!